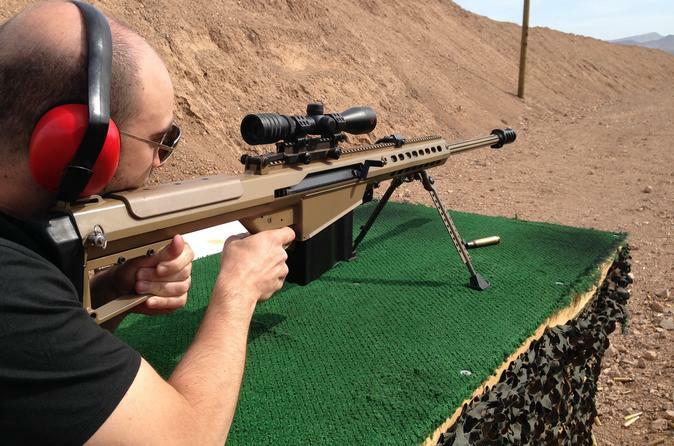 Set in the Mohave Desert, enjoy the chance to shoot a wide variety of guns at a military style outdoor range on this shooting adventure from Las Vegas. Your expert instructor will show you the proper techniques necessary to line up the best shot. Combine this adventure with a helicopter tour through the Grand Canyon and ATV Tour through Lake Mead National Park to the Colorado River for a full day adventure! Lunch, hotel pickup and drop-off and all necessary equipment is included. After hotel pickup, your journey begins with a complimentary 15-minute photo stop at the Hoover Dam Bridge where you can see Hoover Dam and Lake Mead. Next, you'll drive to the range located in the Arizona desert. Your professional instructors will provide you with a safety orientation and provide you with information on how to properly fire your weapons. Please see the Itinerary section below for a full list of available packages. You'll then be escorted to the outdoor range which will make you feel like you're in Desert Storm. While on the range, feel free to take as many photos and videos that you would like. After your shooting, you will will be treated to an all-American hamburger lunch at the onsite restaurant. Vegetarian options are available upon request. You can upgrade your experience at the time of booking to include an ATV tour through the Lake Mead Recreational Area and a 90-minute helicopter flight through the Grand Canyon with picnic and champagne landing for a full day of sightseeing. Venture into Lake Mead National Park and see the Colorado River, Hoover Dam and the mines of Eldorado Canyon on a 3-hour ATV tour with your friendly, professional guide. Take in breathtaking views of the Grand Canyon's West Rim on a 60 minute flight with 30 minute champagne landing.